Tony Durcan, Newcastle City Librarian, points out that there will be at least 40 new libraries or major refurbishments in 2012 and smaller ones are being rebuilt too. A local authority might close three libraries “that might have had their day” and open a new one. Nineteenth Century buildings are sometimes forbidding and only for those who worship at the temple of knowledge: modern libraries are transparent so you can see people like you inside and thus be more tempted to come in. 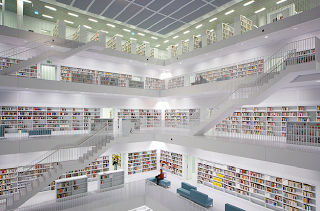 Nigel Tonks and Alastair Guthrie, Arup consulting engineers: responsible for building major new libraries worldwide, say that there have been a “renaissance in library buildings”. The purpose of library is “moving from a hush environment to a buzz environment”, becoming a “community living room”. The new Seattle Library replaced an unattractive 1950s building, heavily used by the homeless but not many others. The new “crystalline ziggurat”, attracts two million visitors per year. Its central space is called the “living room” with a “direct connection to the city”, offering views to the water and to the mountains. “You want to have a building that the city is proud of” says the interviewee. People have been coming in specially who had never been in the library before, even making the building busy over the traditionally quiet time of Christmas. 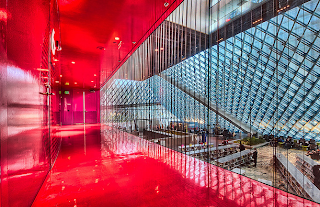 Major authors visiting Seattle now want to do talks there (old library successful programme was 20 people, now its 150). There is a removable floor and changeable lighting to allow for flexible spaces. 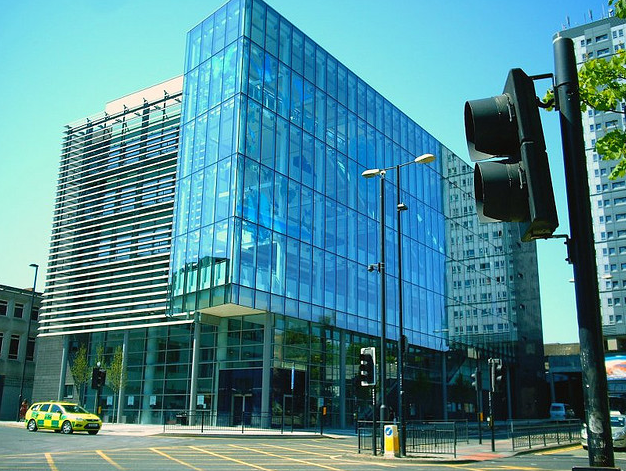 The Library offers not just books but council services, tax offices and housing services. 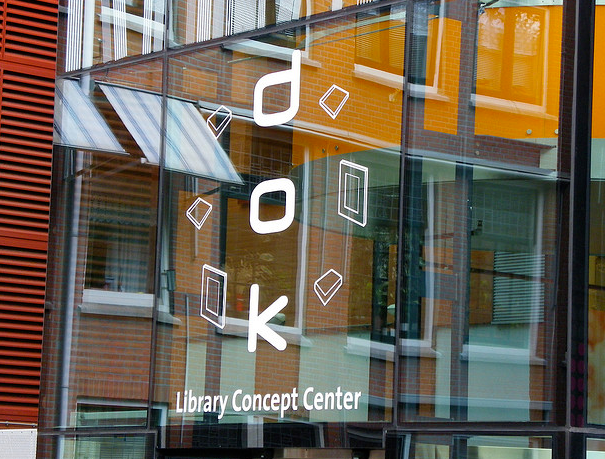 Dok Library: picture courtesy of Ellen Forsyth via Flickr. Holland is a trendsetter for public libraries, with even Schiphol airport having a library. The gem, though, is Dok Library which is “providing a model for what the library of a future might be”. It’s manager says that just providing books “will see the demise of libraries”, going on to say that the most important resource that libraries have are the people”. A very impressive 80% of the town uses the library. For instance, business people use library for wifi and meetings space, even asking to use the library address on their business cards. There is even a piano (with headphones in) that is always used. There’s a media laboratory so that people can ask questions like how to use Flickr, tablets, etc and be answered, just like an Apple “Genius Bar”. Complaints come from people who don’t want their kids playing computer games in the library but games are being tailored by the Library to be educational. All this change is necessary as “we used to think that libraries don’t have competitors” but there are a lot of options now. “The books don’t protest when the library closes, it’s the people that protest”. Branding is needed. Libraries need a branding identity, with corporate fonts, colours, even uniforms. Libraries do have some inherent advantages over the internet as “it’s bloody hard to browse ebooks”. All electronic media is geared to telling you what you like, whereas libraries are the opposite of this. 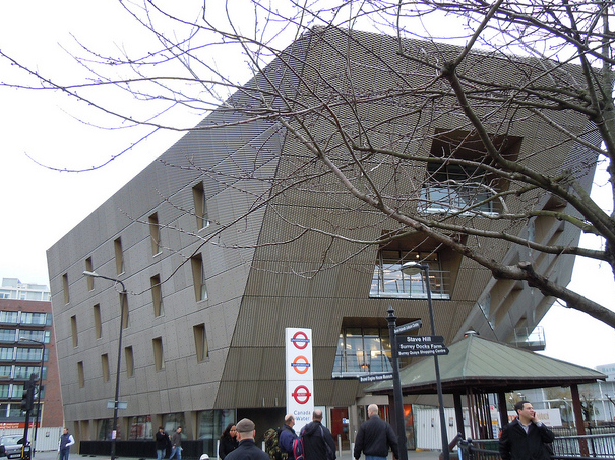 The show then moves on to the new Canada Water Library. 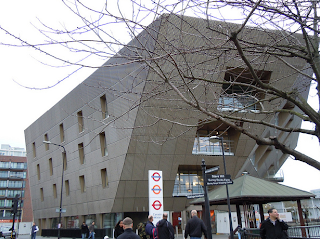 An exit from the tube comes out into the library building. The building is an inverted pyramid, with a grand theatrical circular stair. The architecture recognises the need to compromise between grandeur and not making the building off-putting to people. In Newcastle, there were two final designs for big new library, decided to go with the one that appealed to younger people the most. “The public library service becomes the quality town square with a roof on top”. Moving on to Germany, the new library in Stuttgart boasts 5,500 new library card holders in the first 100 days after it opened Autumn 2011. The town wanted an institution that brought life to the new “Quarter” that appealed to everyone so thought of a library. “Now there is life in this area because so many people go to the library”. New libraries are connected with new technology and media in people’s minds so building a new library is a strong political statement and attracts new business and raises house values. Finally, the show goes to Birmingham. It’s glass facade and grandeur mean its a “people’s palace” for the city and its £188m construction is “unashamedly about adding to Birmingham’s credentials as a world class city”. The library expects to receive about 4 million people per year, making it by far the busiest in Europe and a “mother ship” to all the citys’ branch libraries, being a catalyst for regenerating the 40 smaller libraries in the town. 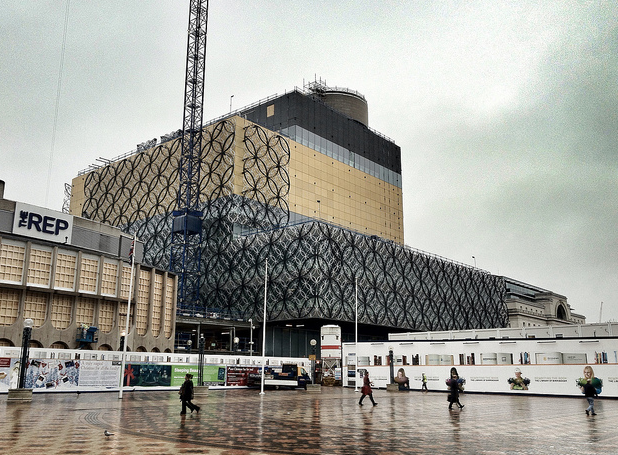 Birmingham’s political leadership very much committed to keeping public libraries open. The appeal of the library is intended to be all encompassing: local studies archives are in the same building as modern media/arts/technology links with the citys’ universities. The new central library has escalators, a huge central space, very bright open spaces and an outside auditorium with events spilling out into the town centre. The decoration on its outside looks like a lot of interconnected bracelets, producing unique pattern of shadows in the library. For me, “The Library Returns” served two useful purposes. First, it showed that there are good things happening in public libraries. It can be awfully depressing reading all the bad news stories. Secondly, it shows that despite all the doomsayers, there is plenty of life in the public library world yet. The programme though does not link the two together. Allow me. All of the new libraries being built and all of the good things happening are happening despite the current harsh conditions. Canada Water and Birmingham have been built because they started before the current cuts. They would stand no chance now. The programme shows that investing in libraries gives not only them but their communities and indeed whole cities a new chance of life. Clearly, Canada and Germany and Holland see a strong economic as well as cultural benefit to investing in their libraries. Under the current government, and most especially under the current ministers, such a chance, such an economic boost, is being denied to those unlucky enough to have not got beyond the starting blocks in 2010.